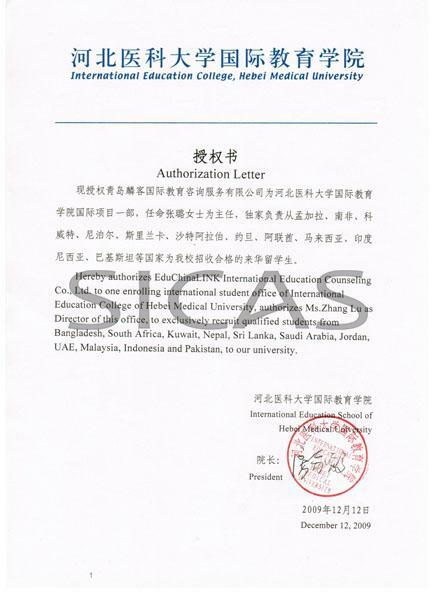 Hebei Medical University is recognized by WHO and the graduates of MBBS program are eligible to take the Medical Licensing Examinations held by the medical councils in different countries such as MCI, PMDC, USMLE, HPCSA, SCHS etc. 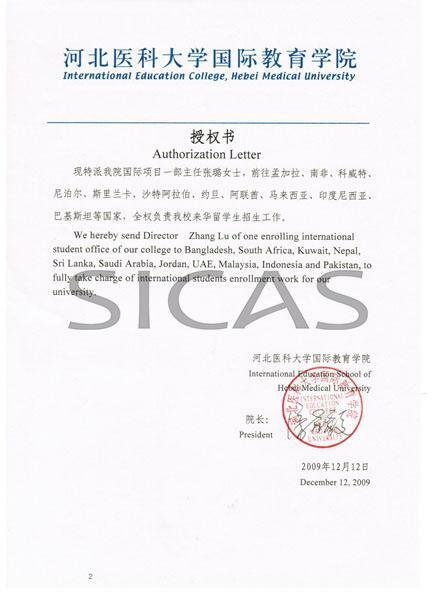 Students can choose to do the internship/training in China, their home country or any other country. The tuition fee for internship year is RMB 30,000 per year. HEBMU highly recommends international students to do the internship in China; it would be done at one of the affiliated hospitals. Hebei Medical University owns 6 hospitals, 4 of them are provincial-level ones. They have a total of 4500 sickbeds. In addition, there are other 16 secondary hospitals, 60 teaching hospitals and internship bases. If students want to do the internship in other country, HEBMU need to do a qualification evaluation on the hospital which student chooses, and student has to provide the contact information. And, students have to take the final examination on Theory Test and Clinical Evaluation in HEBMU before graduation. On completing the requirements of the teaching program and passing the graduation examinations successfully, international medical undergraduates will be granted a graduation certificate and conferred a medical degree by HEBMU, if they meet the degree regulations of the university. The English copy of the degree will state MBBS (Bachelor of Medicine and Bachelor of Surgery). 2.With an educational background equal to high school graduation in China or have passed Grade Twelve (10+2)/FSc./A Level/WAEC or equivalent. 3.At least 60% score in science subjects (Physics, Chemistry and Biology).